Finally at the end of the day we visited the library and got to look at illustrations of some of Cloudesley Shovell's victories and the log book from one of the surviving ships from the night of his death. The log book mentioned some of the harsh conditions the sailors faced. We also got to see the consolatory letter sent by the Reverend at St Paulinus Church, Crayford to Lady Shovell in her time of grief. It was this national tragedy of the loss of her husband that saw the Longitude act being put in place to prevent anything like this happening again. When they finished filming Harrison's clocks they filmed the interview with Dr Richard Dunn, a curator of the Ships, Clocks and Stars exhibition, who provided us with a lot of great answers. We also found out that at the time France had been in the process of attempting to calculate Longitude using the stars and moon. If Britain had not found how to work out Longitude, would have France eventually found the solution through their method? After that they interviewed John Harrison who spoke about how Captain Cook took the K1 (a copy of the H4) on board and navigated successfully aided by this pocket watch from the tropics to the Antarctic. Harrison also spoke about the poor treatment of himself on behalf of the board of Longitude as he never received his prize money, even after meeting their requirements for the prize. It was only after his son appealing to King George III that he finally received part of what was rightfully his. We got to the museum this morning and the two film crews set up their equipment. They recorded John Harrison talking about his three clocks which are displayed in the cabinet named H1, H2 and H3. We also got the opportunity to see them wound up before the exhibition was open to public viewing. Harrison explained how his first clock took five years to make and that it was not until he reached the forth development of his timekeeper that he finally succeeded in making it more accurate. Dementia - How can we help people with dementia to live independently for longer? 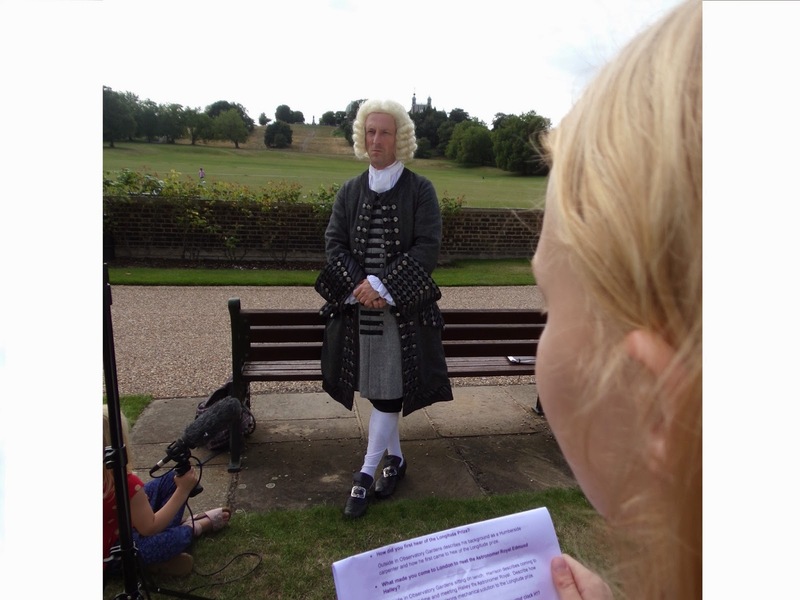 When interviewing John Harrison we discovered that when he came to London for the first time he met the Astronomer Royal Halley. He was very supportive of Harrison's invention and solution for the Longitude prize. We also learnt that despite creating such an advanced device, that would seem could have only be made by a rich scholar or scientist at the time, Harrison had actually started out his career merely a carpenter. Harrison did not get on with the new Astronomer Royal Nevil Maskelyne who disregarded his work and in addition, took the H4 which greatly angered him. After changing locations we were told by Harrison that even the greatest scientist at the time, Isaac Newton, did not believe that the clock would be the solution to finding Longitude. Newton had a stronger belief in the astronomers and thought that calculating Longitude from the stars and moon would more likely be the solution to their problems. Lady Shovell speaks about her grief due to her husband's death. She read from the consolatory letter that was sent to her by Reverend Gilbert Crockatt of St Paulinus Church in Crayford. We learnt that he was good friends with her husband which was why he had sent her this letter. He had said in the letter; 'the shortest lines are usually the straightest' and 'Nor is a circle less perfect for being small'. She explained that these lines gave her hope that one day lives will no longer be lost at sea, and that sailors will be able to sail the shortest, safest routes because they will finally have awareness of their Longitude. Lady Shovell reacted to the relabelling of her husband's portrait and was shocked, she wondered why her husband was remembered like this when he had achieved so much in his lifetime. A line of the caption read "Cloudesley Shovell, renowned collector of sticks." Later on in the day they interviewed Dr Finch Boyer, curator of the exhibition who explained that the artist responsible for the caption had found Shovell's name so ridiculous that they couldn't take him seriously, thus influencing them when creating this humorous caption. The other group filmed John Harrison who explained his first pendulum clock H1 which is replicated in the exhibition also featuring a comical label. He spoke about how, even after creating the bimetallic strip that compensated for heat changes, his invention still didn't meet the requirements of the Board of Longitude. The girls from En Pointe dance group arrived in their outfits ready to perform their Horn pipe dance on the Greenwich meridian line. The rest of the group set up the cameras using the skills they have learned and filmed the dance routine. Content by Holly Robjohns (HollyRobjohns@hotmail.com). Awesome Inc. theme. Powered by Blogger.